The next time you buy a LED TV, you may not need to drill a damaging holes on your wall. 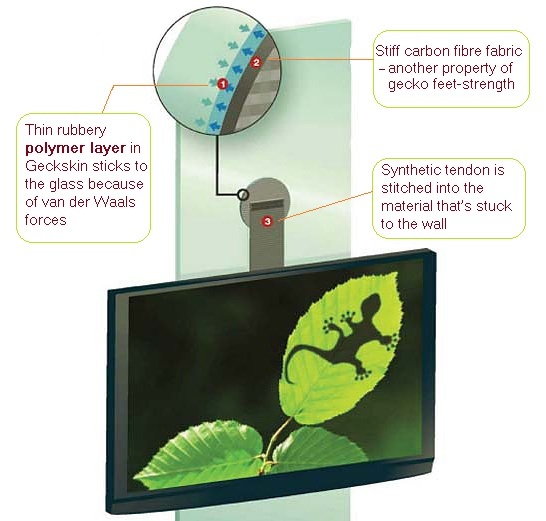 Especially if your wall have surfaces made of glass, all you need is a gecko-tape and you can easily hang your super-sized TV on it. Don't worry, your TV could just be 20kg at the most. For years man has been fascinated by the ability of geckos to run up walls feeling absolutely at home. Now a gecko-inspired sticky tape has been developed that could do everything from sticking a TV to a wall to holding parts of a car together. No kidding. Not only is ‘Geckskin’ incredibly sticky stuff – capable of fixing 300kg to a flat surface – it can also be released with a gentle tug, and reused over 100 times without losing its strength. Previous attempts to construct such an adhesive focused on mimicking the microscopic hairs that cover gecko toes. But it proved difficult to make larger pieces of these fabrics. Instead Geckskin, developed at the University of Massachusetts, Amhurst, employs other properties of gecko feet to impart its sticking ability- it is incredibly tough while being flexible enough to make close contact with whatever surface it’s sticking to. In a demonstration of its abilities, the material was used to fix a 42-inch flat screen TV to a glass surface (refer to the above figure). A thin rubbery polymer layer in Geckskin sticks to the glass because of van der Waals forces – an attraction between the molecules of the two surfaces. As the polymer is so flexible, it moulds to the glass surface, maximising contact between the molecules in the glass and polymer. A stiff carbon fibre fabric provides the other important property of gecko feetstrength. A synthetic tendon is stitched into the material that’s stuck to the wall. This is attached to the television’s mounting bracket. Several tests and R&D's claimed that the gecko adhesive can hold weight in access of 300kg (700 pounds), which is good enough for a person to 'go-spiderman' and climb the Petronas Twin-Tower or Yayasan Sabah buildings. But for now, I wouldn't bet my money on contractors using it for their glass cleaning works with sky-scrapper buildings just yet. It's a good addition to the existing safety measures though.